Find out how Adobe created brand ambassadors out of their employees. Social media influences 20% of subscriptions to Adobe Creative Cloud. A greater percentage of Adobe employees are sharing content about Adobe on Twitter than any other tech brand employees in the world, per Social Look. As of mid-2014, approximately one-third of Adobe’s 11,000 employees have taken Social Shift training to be brand ambassadors. In some months, one Photoshop brand ambassador has generated more revenue than the official Adobe @Photoshop Twitter account. In 2013, Cory Edwards, head of Adobe’s Social Media Center of Excellence, was pondering how Adobe could use social media to influence more sales. A corporate social media professional for seven years, he knew firsthand how difficult it can be to get senior executives active on social media. Then he discovered the Edelman Trust Barometer report. The report showed that while trust in CEOs has been declining, trust in company employees has grown. 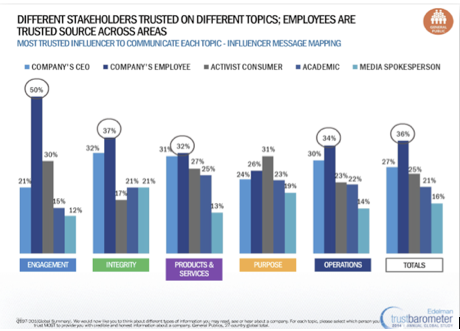 Edelman Trust Barometer data shows employees are a trusted source of information. “We had a ‘Eureka!’ moment about how much value the average employee could bring,” Edwards said. As a result, Adobe now focuses on empowering all employees to be brand ambassadors. Their efforts are paying off. 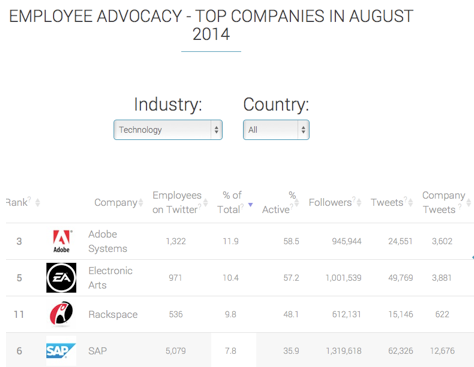 Adobe first assessed where they stood regarding employee advocacy. They checked the SocialLook leaderboard, which measures employee advocacy through Twitter accounts. SocialLook bases its measurements on Twitter accounts whose bios specifically mention working for a particular company. Edwards was surprised to find that Adobe was already ranked 4th for tech companies. Since implementing programs to empower employees to share on social media, they have consistently ranked in the top three, hitting the Number 1 spot three months in a row. The SocialLook leaderboard shows that a greater percentage of Adobe employees share content about the company on Twitter than any other technology brand. One way that Adobe makes it easy for employees to share about the company is through the hashtag #adobelife. It was started by Adobe’s head of employment branding, Natalie Kessler. The idea was to promote the lifestyle that comes with working for Adobe. Edwards said that the #adobelife hashtag is “plastered around” any event held for employees. Employees are encouraged to take pictures and share updates using the hashtag with their friends, family and followers. The company often gives away token incentives such as water bottles to encourage hashtag use. 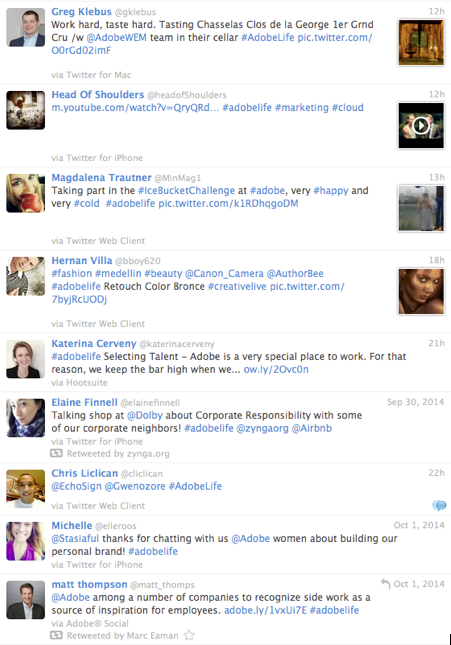 The #adobelife hashtag makes it easy for employees to share about the company. Promoting the hashtag was a good first step. But Edwards wanted employees to feel comfortable talking about the Adobe brand beyond using the hashtag at company-sponsored events. Employees need to feel confident about social sharing guidelines to be good brand ambassadors. If they are worried about being reprimanded, they’ll be less likely to share. That realization was the impetus behind Adobe’s Social Shift training, developed by the Social Media Center of Excellence. It is funded through an internal grant from the company’s annual Seeds of Innovation competition. 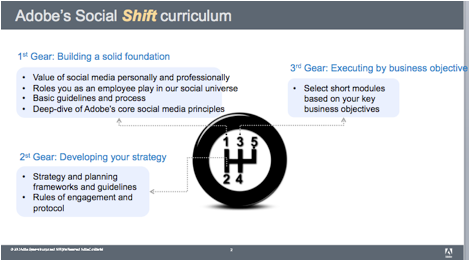 Social Shift uses a driving metaphor, and has three “gears” of graduated training. Each level is directed at employees with different types of responsibilities. 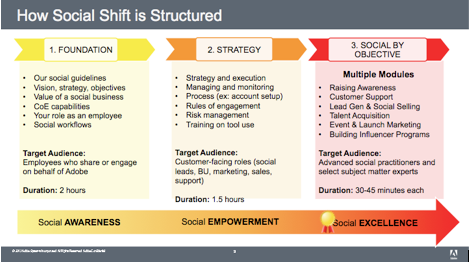 Adobe’s Social Shift training has different levels geared towards different types of employees. The “first gear” training is aimed at any employee who would potentially share company-related content or engage on behalf of Adobe using their personal social accounts. Adobe’s goal is to have all employees complete this training. 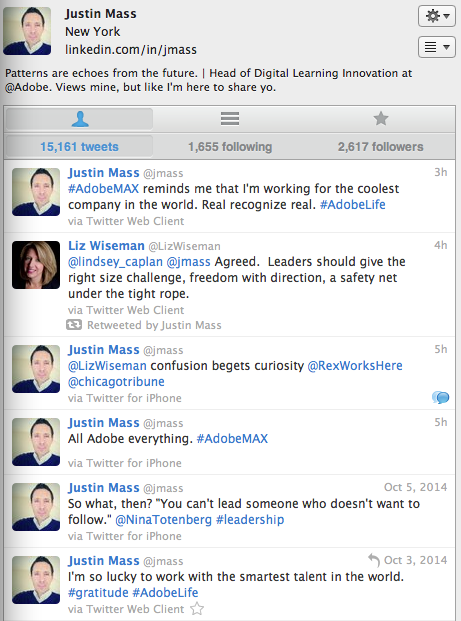 Adobe’s Justin Mass is a prolific Twitter user and brand ambassador. The first half-hour of the two-hour in-person training introduces Adobe’s four key social media pillars: Authentic, Responsible, Involved and Respectful. The last hour and a half of the training walks through each pillar and puts employees in the “driver’s seat,” where different real-life scenarios are presented. The class is asked to comment and brainstorm on the correct approach to take based on applying the principles of each pillar. Edwards noted that employees like the interactive nature of the Social Shift training. Because of the interactivity, Adobe wants the majority of employees to participate in person. They have started a “train the trainer” program to roll it out to each of their global regions. They also developed a virtual version of the training to serve small sales offices in more remote areas. The Social Shift training is platform-agnostic, and purposely avoids “how-to’s” on any social platform. Edwards’ philosophy is that people can find plenty of outside resources for that. Adobe trusts it’s employees to represent them. Image: Shutterstock. “We’re focused more on teaching them the guidelines, giving them guardrails to help them be safe when they want to talk about Adobe,” he said. The beginning of the training shows employees the Edelman Trust Barometer data to bring home the message that each employee is critical to the company’s success. “We consider every person in the company to be a brand ambassador,” Edwards added, even if he or she is not involved in any branded social media accounts. 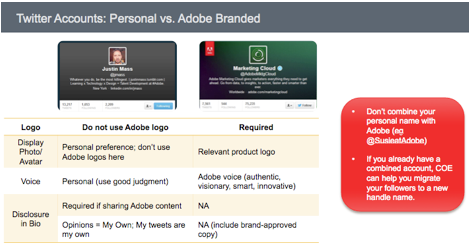 Adobe also acknowledges that employees may use the training to build their personal brands. The company does not place restrictions on employees’ use of social media, preferring to leave conversations about employee use of time to direct managers. Adobe’s training focuses on providing guidelines vs. restricting social media use. Adobe identifies employees who want to go further using social through post-training surveys. About 20-30% of employees who take the first course go on to register for additional training—the second and third “gears” of the program. 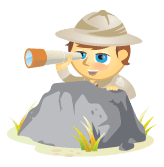 The second level focuses on developing social media strategies. “We talk about what a social strategy is, how to manage and monitor the accounts you’re setting up, what the processes are,” Edwards said. Anyone wanting to set up a branded social media account must take this training level. Similar to the first level, trainees get into groups and do an exercise creating a social strategy based on one of seven or eight example scenarios. “Many of those scenarios are areas where we are actually looking for good ideas,” said Edwards. Adobe’s Social Shift training empowers employees who want to go further. The third “gear” has several shorter modules based on using social media for accomplishing key business objectives, such as raising awareness, customer support, lead generation and talent acquisition. Some of these modules are still in the creation phase, and Adobe has plans to expand the list even further. “We take employees from social awareness to social empowerment to social excellence,” Edwards said. Adobe has made significant changes in 2014 to how they secure and manage their social accounts in order to mitigate potential risk. “We’ve moved away from having any personal credentials used for the creation of a brand account,” Edwards said. Adobe uses IT-managed email accounts for all brand social media accounts. An employee’s personal gmail address or work email is never used. In addition, all account credentials are migrated into a secure, encrypted management system that lets the IT department track all of the branded account credentials. If an employee wants to set up a branded account, they access it through Adobe’s own social media management tool, called Adobe Social. If the employee leaves or no longer is in charge of that account, IT simply removes his or her administrative access within the Adobe Social tool. This prevents former employees from potentially holding a social account hostage. In general, however, Adobe has found much more benefit to having employees active on social media than not. 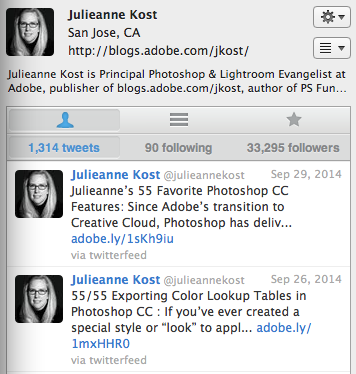 Adobe’s Julieanne Kost posts links to her tutorials on her Twitter account. One brand ambassador, Julieanne Kost, is principal Photoshop and Lightroom evangelist at Adobe. Her job involves lots of demos at road shows, travel to conferences and engaging with customer groups. She started a blog of her tutorials, and later started posting them on her personal Twitter account. She now has over 33,000 followers, and in some months, Creative Cloud subscriptions driven from her account have surpassed those of the official @Photoshop branded account. Kost connects to Adobe customers through her blog and comments. 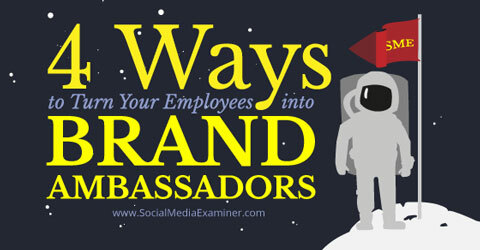 Are your employees brand ambassadors for your company? How can you make them more confident in posting about your company? Include your comments and questions below. Trust icano photo from Shutterstock.